Chinese dogwoods are broadleaf, flowering, deciduous trees. Wolf Eyes Chinese dogwood tree flowers in late spring to early summer, for a period as long as 6 weeks. The credit for the white “floral” show, though, goes not to the actual flowers (which are small), but rather to “bracts” (which, to the observer not thinking in botanical terms, look like petals). The rounded berry that succeeds the flowers starts out yellowish-green; it is surrounded by the white bracts. I suppose this is how the plant got its name: the berries being the pupils of the wolf’s eyes, the bracts being the whites of the eyes. The ripened berry is raspberry-like in appearance, bearing a red color. Note that the berry is larger and more complex than that on Cornus florida. Foliage is variegated. In autumn, the leaves develop streaks ranging in color from pink to red. The form is spreading, with multiple branches tracing a somewhat horizontal pattern. At maturity, Wolf Eyes reaches 10 feet in height or more, with a slightly greater spread. Older trees often develop a mottled bark (which also peels), lending this specimen further visual interest. Remember, the appearance of a deciduous tree’s bark and its branching pattern are critical factors if you are seeking specimens that will remain interesting even in winter. While Wolf Eyes Chinese dogwood will stand only 10 feet tall at maturity under some conditions (taller under other conditions), other Chinese dogwood trees may reach 30 feet in height when mature. As you would expect with a common name like “Chinese dogwoods,” Cornus kousa is indigenous to the Far East. The ‘Wolf Eyes’ cultivar can be grown in planting zones 5-8. 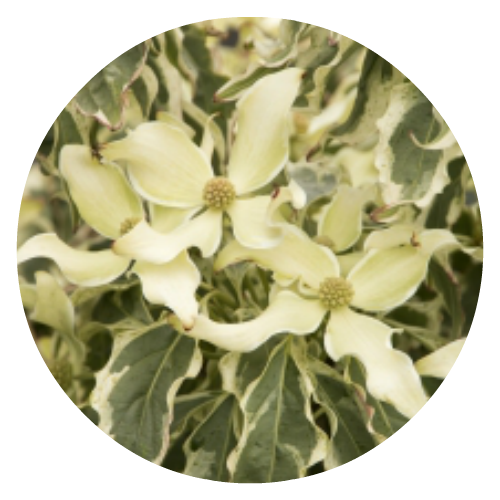 Plant Cornus kousa in partial shade and in a well-drained, acidic soil. First of all, consider the sequence of bloom in your landscaping. 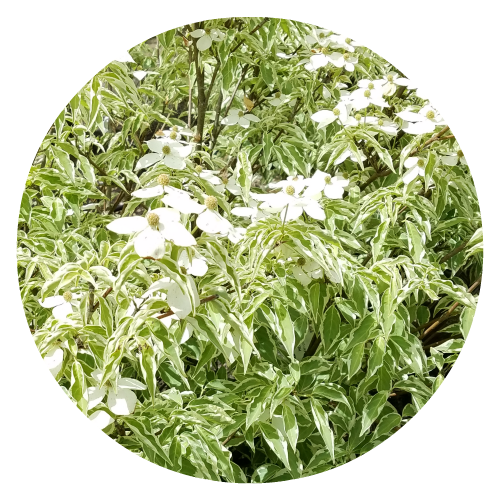 Like other types of Cornus kousa, Wolf Eyes blooms later in the spring than does flowering dogwood(Cornus florida) — an important factor to consider if you are trying to stagger bloom periods in your yard so as to improve year round interest. In fact, Wolf Eyes rates as a four-season tree, thanks to the characteristics listed here. Since it stays short, use Wolf Eyes Cornus kousa as the understory element in a loose privacy screen of trees and shrubs on a border. Its variegated leaves also make this Chinese dogwood a legitimate specimen tree. A slow growing tree that stays compact, Wolf Eyes is a better choice than most trees for planting in foundation beds. Provide Wolf Eyes dogwood trees with sufficient water during hot spells. While its leaf margins are supposed to be wavy, the leaves on my own tree curled excessively during their second summer (due, I suspect, to insufficient water). In cases of extreme drought, kousa dogwood leaves will turn brown along their margins. But Cornus kousa is reputedly more disease resistant and more tolerant of alkaline soil than Cornus florida. Of particular importance is the fact that Chinese dogwood trees are more resistant to the anthracnose fungus than are Cornus florida trees. Chinese dogwoods are good trees for attracting birds, as wild birds will eat the berries. Birds are one thing, Bambi is another. Fortunately, these plants are deer-resistant trees.